Below you will find excerpts from the landmark 1901 book by John Morris titled "The Welsh Wars of Edward I". Although contemporary research is now challenging some of the commonly accepted assumptions regarding the Norman conquest of Wales, Mr Morris's book remains a valuable resource for today's historian. This particular chapter deals with the situation in Wales prior to 1277 and focuses specifically on how events unfolded in north Wales. Along the way Mr Morris helps us understand how and why the Marcher lordships were established across the Welsh-English border. The conquest of Wales was first taken in hand by the restless adventure-loving Normans who had come over with William the Conqueror. It is quite true that Saxon Harold had already made an impression, and the final annexation by Edward may very fairly be regarded as the assertation of English supremacy. But, during the two centuries which separated Harold and Edward, the prominent figure on the march of Wales was the Norman adventurer. He had fought at Hastings as an adventurer looking forward to a grant of English land as his reward, and he had been disappointed; for William conferred manors, but took good care that the baron should not become independent of the crown of England. On the border of Wales, however, things were different. There was hardly an active race to be conquered, and regular methods of war were out of place. The men of the mountains fought in guerilla fashion. They had natural fortresses to which to retreat, and it could never be expected that, being beaten in in one battle, they would submit at once and for ever. Therefore, William and his sons could authorize, or else tacitly allow, what in England they were determined to prevent. If their Norman lords loved adventure and fighting, they might settle on the march, conquer as much of Wales as they could, and hold as their own what they had conquered; so that their high spirit might be thus diverted into a country where they had plenty to do, and little opportunity to make themselves dangerous to their king. To the native Welsh chroniclers the invaders of their country were 'Frenchmen,' who fought in the 'Gallic' style. The mailed horseman and the stone castle were always in evidence, the grim Norman fighting-man and the grim Norman fortress. Like their ancestors who conquered Normandy, like their kinsfolk who pushed on to Italy and Sicily, the Norman lords who settled on the borders of Wales - lords marchers they came to be called - domineered and grasped. They conquered for their own profit, and they satisfied the ambition which was characteristic of their race. They had their fill of the fighting which they loved, they had excitement, and they were their own masters. They were much more free than the barons of England. Or it might be that some lord had both fiefs in England and lands on the borders of Wales: in the one case he was fettered in various ways, might not build castles at his will, and had to perform the duties imposed on him by the conditions of feudal service: in the other he was free to fight his way into Wales, and to build castles so as to hold what he had won. In this way the work of 'Normanization' was more complete on the march than elsewhere in our island. One can hardly say, however, that the early Norman kings deliberately devised this method as the the cheapest way of conquering Wales and also of giving their barons plenty of that hard fighting which would keep them too busy to rebel. The 'custom of the march,' namely, that the lords marchers could wage private war at will, grew up rather as a natural consequence of the state of affairs which prevailed after the Conquest. None of the kings could spare the time which was necessary for a permanent conquest of Wales. They had to organize and govern in England, look after their possessions in Normandy or Aquitaine, gratify their ambition by the more highly attractive task of crusading, or crush baronial risings. Thus for more than two centuries no king put himself resolutely to subdue Wales until Edward did. Royal expeditions were, indeed, frequent, but spasmodic and rarely successful. Meanwhile, the resistance of the Welsh was being gradually worn down by the lords marchers, who had a direct profit in the work, the kings rather allowing than actually authorizing them to do so. The lords who were originally planted by the Williams on the flanks of the Welsh, their direct descendants, or the new men who by marriage with heiress came in to carry on their work, must have the sole credit for the successful wearing down. But in saying this we have to make a strong distinction between the fortunes of the Norman invaders on the northern and middle marches and those of their more lucky comrades of the south. There are two separate chapters in the history of Wales up to the reign of Edward. North Wales and South Wales were quite distinct both politically and geographically, the great block of central mountains forming a barrier to keep them apart. The Princes of Gwynedd, a district roughly equivalent to Snowdonia and outlying valleys, claimed at times overlordship over the princes of South Wales, Cardigan, and the Vale of Towy. But rarely did they actually penetrate to the south with an armed force. Similarly, the Earls of Chester and their neighbors had little in common with the lords marchers of Glamorgan and Gwent. And as war was waged independently in either direction, so the results varied. In the two centuries the Norman conquest from Monmouth to Pembroke and Cardigan was steadily successful, following the line of the coast and striking up the valleys of the Usk and Wye, and this region was studded over with Norman castles. On the other side very little advance was made beyond the present boundary lines of Cheshire and Shropshire, the efforts to conquer along the north coast were unsuccessful, and a belt of fortresses rather protected the western parts of England than threatened the north-east borders of Wales. When Edward came upon the scene he found south Wales more or less securely held by the marchers, but he had to start over from the very confines of Chester itself to carry out his great invasion of Gwynedd. William I began by creating two counties palatine - counties whose earls were practically independent administrators - namely Chester against the Princes of Gwynedd, whose power stretched out from Snowdonia to Flint; and Shrewsbury against the Princes of Powys, who were settled on the upper Severn and upper Dee. There was also an outwork at the mouth of the river Clwyd, where rose the castle of Rhuddlan, some three miles from the sea on the right bank. The early palatine had to hold the border, and to conquer across the border as they could. William was, in fact, making a dangerous precedent. He, whose great aim in England was to avoid the creation of powerful feudal baronies which might be too strong for the crown, was on the Welsh border founding two such possible sources of danger. So he had to choose his men carefully. The first Earl of Chester was his own nephew, Hugh of Avaranches. Hugh held Rhuddlan of the king, and kept half the borough in his own hands in dominio, while a certain Robert was his man and held the other half. The Earl of Shrewsbury was Roger of Montgomery, who in 1066 had been left behind in Normandy as one of the regents. Personal loyalty was the tie which was expected to bind them to the crown; for, if to lands in Normandy and England they should add by conquest large possessions in Wales, and then aspire to be altogether independent, they would be accomplishing the very thing which it was the Conqueror's life-work to prevent. Roger was especially powerful; he held fiefs in Normandy and Picardy through his father and his wife, was Earl of Arundel and Chichester in England, and now founded a new Montgomery in Wales in remembrance of his Norman home. 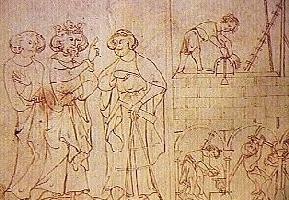 On his death, the hereditary possessions passed to his eldest son Robert, the acquired possessions to his second son Hugh. Hugh of Chester, Roger and Hugh of Montgomery, and Robert of Rhuddlan all contributed towards the work of conquering Wales which had been assigned to them. Success seemed to be certain, and even the island of Anglesey was for a time occupied. But then the Welsh roused themselves, and with the aid of the Norse Vikings regained the island. Hugh of Montgomery was shot by an arrow in the eye 'as though paying the wergeld for England's fallen king.' His death was of great importance. Not only did the Welsh rollback the tide of Norman advance, but also the county palatine of Shrewsbury, becoming vacant, reverted to the elder brother Robert. An apology is necessary for the introduction of so well known a figure, yet it is not out of place to discuss his position. He now succeeding to Hugh's inheritance could control the resources of the county palatine, the Sussex fief and earldom of Arundel, both his father's and his mother's lands across the Channel, with his wife's possessions in Ponthieu; in history he is generally known as Robert of Belleme, the country which was his earliest inheritance through his mother. He acted as his wealth and influence tempted him to act. On the chance of finding Henry I weak on his accession, he aspired to play the part of an independent baron, was unexpectedly crushed, and driven out of England. It was a critical moment in the history of the Welsh march. Henry acted with vigour. Not content with crushing Robert he also crushed another brother, Arnulf of Montgomery, who was settled in Cardigan, for it was imperative to extirpate the family which had dared to dictate to the King of England. Montgomery became a royal castle: Shrewsbury ceased to be a county palatine, and was joined to Staffordshire as a county of the ordinary type under the same sheriff. Thus, on the one hand, was overthrown a power which would have been a bulwark against the Welsh of Powys and a base for the gradual conquest of Central Wales; but, on the other hand, a serious attempt to utilize the peculiar position of a palatine earl towards overawing the crown of England was thwarted. No family rose to take the vacant place. The Fitzalans obtained the lands of Clun in the south-west of Shropshire and Oswestry in the north-west, and succeeded in course of time to the earldom of Arundel; but they held by knight-service, and were hampered by the ordinary feudal restrictions. The Mortimers became an important family on the middle march: Ralph, their founder, was both a sub-tenant of Robert of Belleme and a tenant-in-chief of the crown. But, as a rule, they were either loyal or prudent, and did not yet aspire to independence. The Earls of Chester, the other county palatine, were loyal; at least they did not set themselves in opposition to the crown. They must have been engaged in constantly fighting the Welsh. But the lords of Gwynedd, when once they had recovered Anglesey, more than held their own against the Normans of the March. Frequently we find Rhuddlan occupied by the invaders, but as frequently it was conquered or destroyed by the Welsh. Diganwy, on the right shore of the estuary of the Conway, changed hands in the same way. Neither Rhuddlan nor Diganwy was a centre for gradual conquest and Normanization. The 'Four Cantreds,' the district lying between the Conway and the Dee, that is to say between Gwynedd and Chester, were often the battle-ground of Welshman and Norman; but, when at last they were thoroughly reduced by Edward I, they were still quite Welsh at heart. There was a line of Norman castles built westwards, and therefore a sort of advanced screen ahead of Chester and Shrewsbury. Such were Mold, Hawarden, Oswestry, Caus, Bishop's Castle, Ludlow, and of course Montgomery. But, as was suggested above, they rather formed a belt of fortifications to protect the western borders of England than were bases for the gradual absorption, under Norman influence, of the Four Cantreds or Powys. The result was that the western parts of the present counties of Cheshire and Shropshire were securely held, and were acclimatized to Anglo-Norman system of government, the inhabitants being very largely Welsh, until a line of demarcation was at last drawn between England and Wales. But hardly any impression was made further westwards beyond this belt. The reason is probably to be found in the suppression of Robert of Belleme by Henry I. The crown had had a lesson, and could not afford to let any other family rise to a similar position of independence. Where there was no incentive to private adventure, there was no powerful irruption of Norman adventurers into the heart of Wales. But an exception may be made in the case of the Mortimers, who conquered along the upper Severn. The failure to conquer along the coast and thence up the Clwyd and Conway, is also explained by geography. There is a very narrow strip between the sea and the mountains, and the mountains were then covered with dense forest. The Welsh had cover close upon the flanks of an invading force. Not being able to maintain themselves on this narrow strip, the Normans had no base from which to advance inland up stream. To venture with inadequate transport to cross the watersheds, so as to conquer down stream, was out of the question. Lastly, Chester was not a good naval base. When we come to consider what difficulties were surmounted by Edward, how with a genius for organization and great resources at his back, he could only by great effort cut his way into Wales, hewing paths through the forests and maintaining his lines of communication by sea with ships brought up from Kent and Sussex, we can then understand how, before his time, natural obstacles defied invasion. Kings such as Henry II and John often invaded in force right up to Snowdon. But these royal expeditions utterly failed. The armies were either composed of the feudal vassals of the crown or mercenaries. In any case, they were clumsy and unfitted for an invasion of mountainous districts in the face of an active race of patriots. Time after time they penetrated far west. The Welsh retreated upon their natural fortress of Snowdon, restricted themselves to guerilla warfare, and relied upon the rains and difficulties presented by the geography of their country. They were easily able to reoccupy whatever land they had temporarily abandoned, for sooner or later the heavy columns of the invaders, wearied out by the bad weather and profitless tramping through pathless forests, had to fall back. Had these kings been able to devote several years to the work, without being hampered by their possessions in France or by civil war, they might have slowly conquered Wales by a steady advance, building castles at each step as solid bases for the next move. To plunge into the mountains was to court disaster. Thus we come back to our previous argument. The royal expeditions into North Wales failed because the path of conquest had not been prepared beforehand. Resistance had not been sufficiently worn down by a chronic warfare of self-reliant lords marchers, encouraged to conquer and hold as their own what they had conquered. There was no carefully prepared 'jumping off ground' from which the royal armies could complete the work of through conquest, and the natural obstacles continued to defy invasion. Hence it came about that to the Welsh of Gwynedd the enemy was the King of England or the Earl of Chester, who may fairly be called the king's representative. They had not to fear a race of lords marchers always pushing ahead, always fighting to grasp more lands, building new castles, partly foes to them, and partly defiant of the king himself. Princes of Wales and Kings of England were directly face to face. And the princes more than held their own, for the royal expeditions were only spasmodic. Homage might be claimed and occasionally paid, but it was a deception which deceived nobody: practically, Gwynedd was free. More than that, Gwynedd was the only possible centre of Welsh unity. The great mountain fortress of Snowdon seemed to be impregnable and therefore where there was strength there was a sense of unity. The Princes of Gwynedd came to be called Princes of Wales. Really, there was no more union among the Welsh than among the clans of the Highlands of Scotland: they fought against each other and against the English. But in the north there was less disunion than in South Wales, simply because the princes were powerful men with a powerful country behind them. There was no national cause of Wales, but the cause of Gwynedd came nearly to be national. Llywelyn the Great and his grandson, Llywelyn, Edward's enemy, were national champions at the expense of coercing other Welshmen, and even members of their own family. Yet, with all their power they had not the tenacity of the Bruce: let us add that, like Bruce, they were successful in proportion to the extent of the baronial opposition in England against the King of England. The Llywelyns and Bruce were strongest just when there was civil war in England, or bitter civil dissension on the verge of war.